Seagate has announced its SkyHawk AI hard drive that is designed specifically for artificial intelligence (AI) enabled video surveillance solution. Surveillance storage requires not just high performance but also reliability as it is always-on and needs to be able to handle high bitrate data in order to maintain a smooth recording and high detail footage. However, many of today’s network video recorders do not only record footages but also does additional tasks that involves in deep learning and machine learning applications such as facial recognition and analyzing irregularities, the need for a drive that can handle more than just a data storage drive but can deliver parallel performance without sacrificing the recording quality. The addition of AI means that the storage needs to be able to not just write to the disk at steady rate but also would needs to be able to read from it and without affecting the recording performance. The Seagate SeaHawk AI is solution that is aimed for these types of workloads. According to Seagate, the SkyHawk AI delivers high throughput and enhanced caching deliver low latency and excellent random read performance”that is perfect for the type of workloads accompany the AI tasks. With the SkyHawk AI and the Seagate’s ImagePerfect AI firmware, the drive enabled “on-the edge decision making, eliminating the latency of exchanging cloud-based data and processing,” to deliver reliable recording with high quality video footage with no dropped frame while helping with the AI-enable NVR analytics. We had previously reviewed the SkyHawk drive designed for SMB surveillance DVR and NVR. The SkyHawk is already an impressive drive with 10TB of storage space that support up to 64 cameras. Now the the SkyHawk AI is taking the step even further it now able to record footage up to 64 HD cameras while simultaneously supporting additional 16 AI streams. 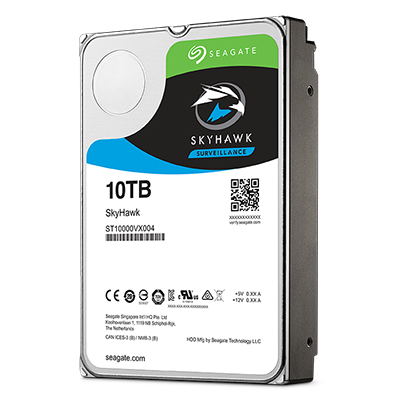 The drive has a rated 5500 TB/year workload, which is three times than the 180TB/year rating found on the SkyHawk. Seagate also boost the warranty on the drive where the SkyHawk AI comes with standard 5 year warranty and 2-year Rescue Data Recovery Services is included. The SkyHawk AI is available in storage capacity of 8TB and 10TB with the MSRP of $449.99 and $349.99, respectively. The drive is now shipping to customers worldwide.